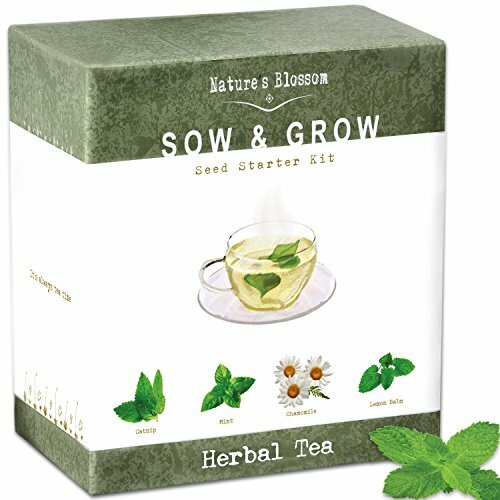 A Complete Kit to Grow 4 Types of Herbal Tea Plants From Seed - No Additional Tools or Past Experience Required. GROW YOUR OWN HERBAL TEAS - Herbal teas make for wonderful, low calorie and relaxing drinks. Apart from having a beneficial effect on health, herbal teas are fragrant and appealing. They are full of antioxidants and other medicinal properties that promote health. ❀ MINT - Spearmint is a popular herb with several benefits which include proper digestion and weight loss, relief from nausea, depression, fatigue and headache, treatment of asthma, memory loss, and skin care problems. ❀ CHAMOMILE -One of the most popular varieties of tea on the market, and it also has many health benefits and uses, including the ability to lower stress levels, aid sleep, soothe menstrual symptoms, protect the skin, boost the immune system, treat gastrointestinal issues and manage and more. 4 X Open pollinated, organic seed packets. 4 X Biodegradable pots - Can be transplanted directly into the ground. 4 X Compressed potting soil discs - expands by 7 times when watered. 4 X Plant labels - for tracking your progress. 1 X Instruction manuak - also sent via email. ✔ Highest germination rates - open pollinated seeds. ✔ Sow & Grow indoor or outdoor. Great for apartments with a lot of windows or a balcony. Get Your Tea Starter Set Today! GROW 4 TYPES OF HERBAL PLANTS FROM SEED - Kit contains 4 foil sealed packets with organic herbal plant seeds - Catnip, Chamomile, Lemon Balm, Mint. 100% SATISFACTION GUARANTEED. EVERYTHING YOU NEED IN A BOX - This herb garden kit contains all the tools for growing an tasty and healthy veg garden at home: Instructions w/ essential growing tips; 4 seed packets, 4 biodegradable planters; 4 soil discs; 4 plant markers. FUN & UNUSUAL GIFT - Nature's Blossom's herbal tea kit is a great diy gift choice for beginners or experts, men, women and children. Popular gift for christmas, holidays, birthdays, housewarmings, graduation and more.